My days on the motorbike kept getting longer now that I was travelling on my own, and by now I was pretty much into the long distance mind-set. This was going to be the longest riding day so far, but I did not intend to do too much at once – the AT is less comfortable as a long distance tourer than both the V-Strom and the Super Ténéré, so I had promised myself that I would take breaks after no more than 100km. It had been raining all night and I don’t like folding the tent when it is wet, but there was no sun in the morning, so it was useless to wait for it to dry. I wiped as much water off as I could, took it down and left with all the layers on the suit on, as it was rather cold. 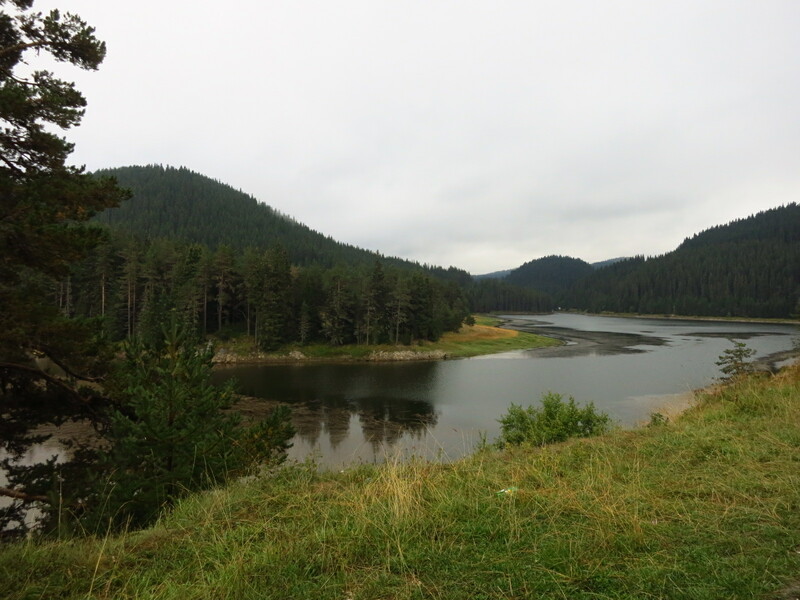 In true Frost style, I took a road less travelled south to a small border crossing, at one more time Bulgaria offered its best landscape – thick forests and mirror-like lakes that would not have looked out of place in Canada. When I reached the border there were only a few cars and two lorries in front of me, but as I had already experienced on my way into the country, Bulgarian border policemen seem to be the slowest in Europe. Once everything was sorted, I rode a short distance to the Greek border, was quickly waved in with the usual Barça comments and rode into what seemed another world. If you had told me that I had teleported to the hills in central Spain I would not have doubt it. What had been lakes and green forests just an hour ago were now golden brown hills, with very few trees, a dry smell in the air and the temperature rising fast. Despite the contrast, it was still very beautiful, particularly through the route I had chosen, avoiding large towns and main roads. I went near a place called Drama, but turned south before reaching it, and it was not until near Serres that I started to find bigger roads. My first good impressions of Greece quickly changed. The landscape was now mostly flat and scorched by the sun, everything had an abandoned air about it, and the roads were no better than what I had found in the previous countries. 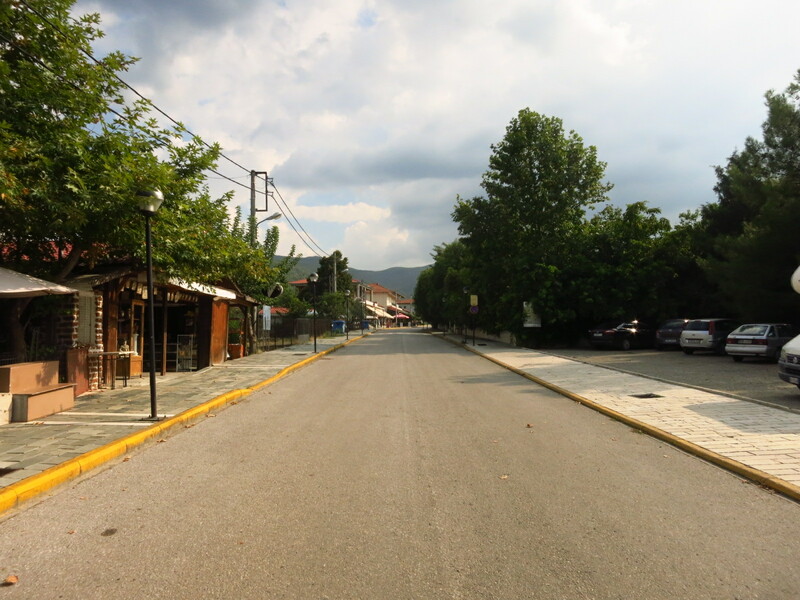 The ring road around Serres looked like a Russian ring road – with catastrophically bad tarmac, junctions with traffic lights every few hundred metres that made fast progress all but impossible and the worst drivers I had found so far on this journey. Greek drivers seem to be very bitter about being overtaken – I would pass a 15-year old car and I could see it accelerating in my mirrors, trying to catch up again. I would stop first at a red light and the car next to me would be in gear, slipping the clutch and ready not to let me get ahead once the lights turned green. For God’s sake, even middle-aged women in crumbling little hatchbacks did it… how on earth did they expect to outrun a motorbike? I took the motorway from there on to try and save some time, seeing there was no landscape to appreciate and the main roads were turning quite nasty, and was surprised to find a row of toll booths after riding a few kilometres on it. There was absolutely no sign anywhere before entering the motorway that announced that it was a toll road. First time I saw it. It was not a lot of money, but I paid it gingerly seeing how bad the tarmac was even on the motorway forming foot-tall folds under the heat and the weight of trucks, not to mention the hordes of nasty drivers. Oh, and they would not take credit cards to pay the toll. 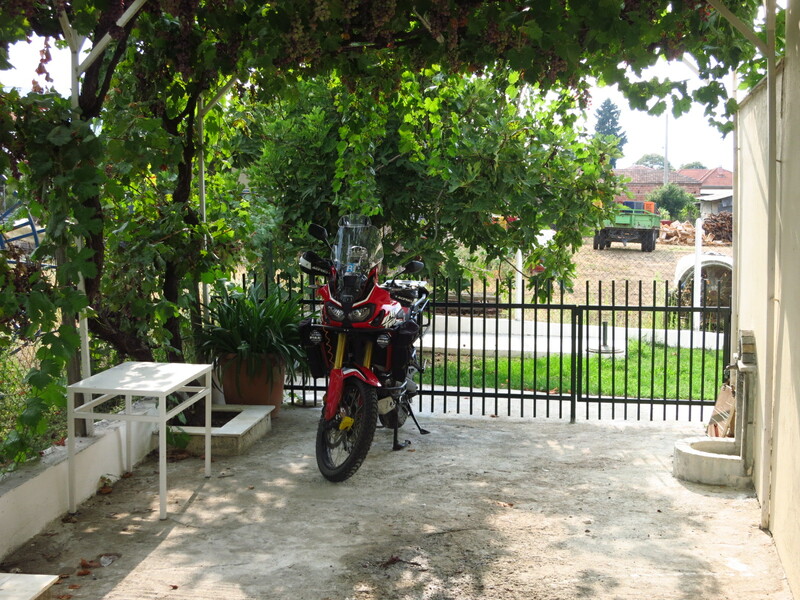 A good while later I was glad to get off the motorway and head into the small town of Vergina, where I had found a cheap room in a small pension. At least this was a good ending to the day – the place was quiet, the room good, the girl in reception very nice, and they let me put the bike in the garden, where I could see it from my balcony. The only negative note was that they would not take credit card either, and all the money I had left were a few Bulgarian Lev, so I ad to go find the only ATM in the village. It took me a good while, as the town seemed to consist of detached houses and no centre, but in the end I managed to find the ATM and a small supermarket where I got some food and the end-of-the-day beer. 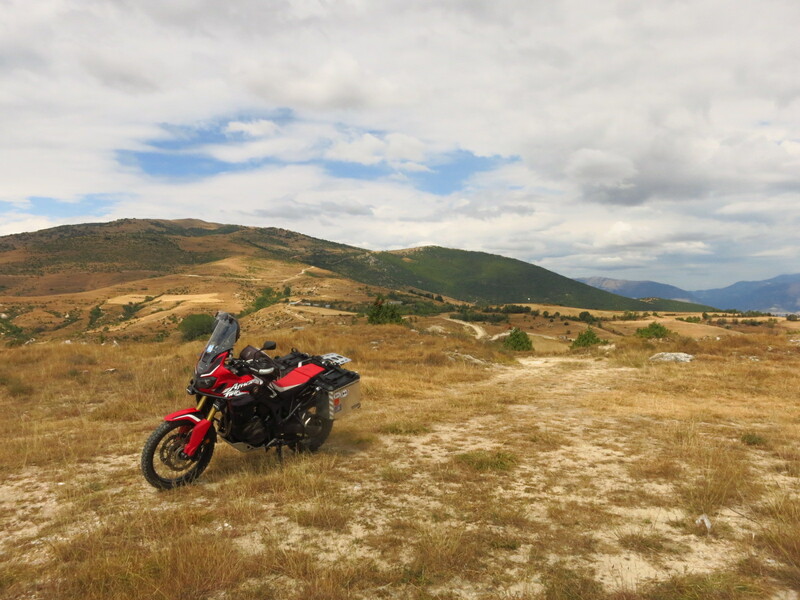 This entry was posted in Balkan Adventure 2016, Travel and tagged Border crossing, Bulgaria, Drama, Greece, Honda CRF 1000L, lake Batak, Serres, Vergina by Kilian. Bookmark the permalink.